Een ruim en luxe huis gelegen aan de prachtige Regina Gardens fase 2-ontwikkeling. Het is luxueus ingericht en beschikt over 2 slaapkamers en 2 badkamers. Compleet met volledig omheinde privétuin met gemakkelijke toegang tot het grote overloopzwembad en de omliggende weelderige tuinen. De accommodatie is perfect voor gezinnen of koppels en biedt ruime open accommodatie met een aparte keuken. Er zijn openslaande deuren vanuit de woonkamer naar de omsloten patio, ideaal om buiten te dineren. De grootste slaapkamer heeft openslaande deuren naar een afgesloten balkon. Taverna's, bars en een supermarkt bevinden zich allemaal op de Tombe van de Koningen, op slechts korte loopafstand, net als de bushalte met regelmatige verbindingen naar de haven van Paphos, de oude binnenstad, Coral Bay en het waterpark. Opmerkingen over accommodatie: Perfecte locatie voor alle leeftijden als dicht bij alle voorzieningen en toch rustig genoeg voor een rustige vakantie. Airconditioning is een tweevoudig doel voor koeling en verwarming. Buiten: Parkeergelegenheid, kleine tuin, terras, BBQ Terrasmeubilair gemakkelijke toegang tot gedeelde zwembaden en lokale voorzieningen Schoonmaak / Handdoeken / Linnen / Schoonmaakservice: De accommodatie heeft eigen kookgelegenheid en wordt voor uw aankomst schoongemaakt. Schoonmaak op doordeweekse dagen kan op verzoek worden geregeld andere: Airco in beide slaapkamers. Lots of nice extra touches. Perfect property for a totally relaxing holiday in a tranquil setting. We have just returned from spending a truly relaxing holiday in this lovely holiday home. The property has everything you need, it's simply home-from-home. Very clean and tidy, spacious and comfortable. Location is nice and private even though there is a little bar just a stone's throw away which is run by friendly ex-pats and serves some nice food. Wifi is available for a very reasonable extra charge. The shared pool is pristinely clean and only seconds walk away. Lidl supermarket is a five min walk away and is perfect for all your essentials. There are some really nice bars and restaurants only a 10 min walk away. Sharon (owner) is so lovely to deal with and she was always available at the end of the phone for any questions we had. We are looking forward to returning again next year. Glad you had a lovely time and found my house like home from home. Looking forward to you staying again next year. 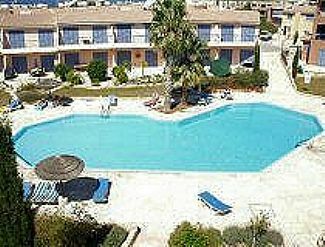 Perfect for relaxing and good Base for exploring Paphos and surrounding area. Found property to be well equipped and fairly clean, no problems gaining access as property manager met us there when arranged and explained the air conditioning and the television set up which was very helpful, wi fi available but there was a charge which to be fair was not too excessive. The property was not situated around the pool, but this was not a problem to us, but I suppose some people may have been disappointed by this. It is a shortish walk down to the main road where there is a Lidl supermarket and a selection of restaurants and bars, the only problem for us was there was no local tavernas in reasonable walking distance, which is what we like, so we always caught the bus into Paphos or Coral bay, the bus service is excellent. There is a bar just by the property which is OK if you just want a drink, but the menu is a bit uninspiring. We would definitely stay in this property again if we are in the area and need a Base. The only minor gripes we had was that the towels provided were a little past their best and there was a lack of toilet rolls. Wow, this is close to my dream home, love the place, it was very clean, decorated really lovely with everything you need. Lovely location with a little bar just a stone throw away, which done some really great food and the people running the bar and the ex pats so friendly. The house has air conditioning, w/m all the items you have in your own home. So lovely and Sharon has some really lovely homely touches to the house. Wish my bedroom back home was like her double room. Lidl supermarket 5 min walk away, you can capture some stunning sunsets by the sea if you walk less than two mins away, bus stop around the corner. be hoping to rent from Sharon again. We have just got back from Cyprus, this house was perfect for us as a family of four (5yr old & 1yr old) weather was lovely. Close to beach and restaurants. Pool is lovely, lidls nearby for shopping. We will be visiting again for sure. Sharon (landlady) great to deal with, could call her with any questions we had. Travel cot and highchair there for our use which was fantastic (no extra hire charges!) we loved it. Glad you had a great time, hope you will be back. I stay at the property twice a year, the house has everything you need. Great sunsets on the patio. A 10 minute walk to some lovely restaurants. If you have a car or there is a bus service on route, to nice beaches, Coral bay is a must. Het gemeentelijke strand ligt op korte loopafstand van het complex. De Plage en Coral Bay zijn gemakkelijk bereikbaar met het openbaar vervoer dat aan het einde van de straat (100 m) beschikbaar is. Paphos Airport ligt op ongeveer 15 minuten met de taxi (15 km) en Larnanca ligt op 160 km en is te bereiken per huurauto. Tomb of the Kings - je staat vast! Fat Mamas (niet te missen) - 10 minuten lopen. Haven - 10 minuten met de bus, 30 minuten lopen (zeker de moeite waard!). Old Town - aan te bevelen bus, vooral in de hoogte van de zomer, maar goede winkels. Coral Bay - 15 minuten met de bus. Paphos markt - 20 minuten lopen. Supermarkt - 2 minuten lopen (LIDL). Troodos-bergen met de bus. Bushalte op 5 minuten van het appartement. De dichtstbijzijnde taverne en supermarkt liggen op slechts 300 meter verderop. Beste Chinese restaurant in Paphos - Chloe's - slechts enkele minuten lopen van het appartement. Uitstekende Indische, Mexicaanse, Japanse en Griekse restaurants op 10 minuten lopen van het appartement. Alle voorzieningen, waaronder bank op loopafstand. Quizavond bij 'Karlinas' ten zeerste aanbevolen. Booking Notes: A non refundable £50 deposit is required on confirmation of booking and the balance is to be paid in full no later than 8 weeks prior to arrival. This can be paid by check or direct transfer. For bookings made 8 weeks or less before date of arrival, the full amount must be paid at the time of booking. Changeover Day: Please contact owner.